Greg, Evan, and Sam left Queens in New York City on July 18th with a destination of Los Angeles, California, hoping to arrive in late October. 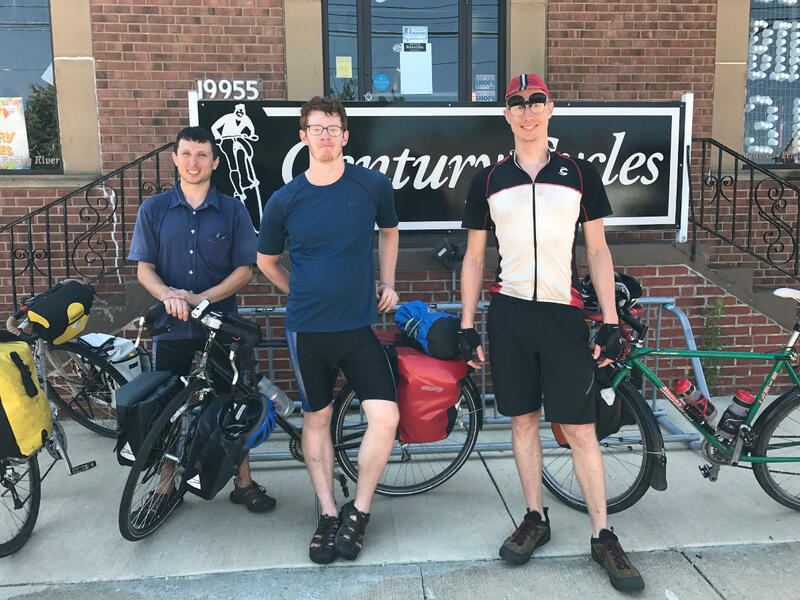 Two weeks into their ride, they stopped at the Century Cycles store in Rocky River for assistance with a loose bottom bracket. Greg will be breaking off in Chicago to get back to work on time in NY (he's already ridden from NY to LA twice before!) Evan and Sam will continue riding an indirect route taking them through many states in the mid-west and western US. They're having a great time, and when asked if they had any words of wisdom to share, Evan said without hesitation, "Anyone can do it!" If that isn't inspiration to pack up and go, we don't know what is! They are maintaining a daily blog and taking turns updating it. Join them on their journey by visiting www.bikemantra.com and read about their adventures as they happen. Travel safely, Gentlemen. May the wind be at your backs and the rubber side stay down! 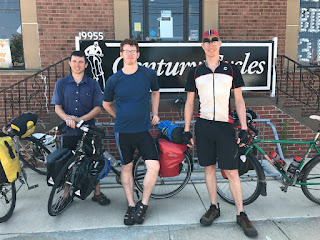 You can see more photos of long-distance touring cyclists that have visited all three of our store in our Bicycle Touring Photo Gallery.